Interesting, "first" credits DLR as the printers. Error or two printers? Oh that's good, "First" is still being published. I must chase them up for mine - including Dr Who. Both error and two printers at least. Intended to be DLR but being printed by Walsall, Cartor (signed for) and maybe Enschede is the conflicting info from various non-official sources. Worst is I have asked for clarification and nobdoy will say. I have my copy of "First" which also states that the "Gum" is PVA - no mention of Self Adhesive? Do we know who will print the RM Signed For? and will they be Self Adhesive? What is the point of the "First" when we have Norvic Philatelics who give us up-to-date information when we need / want it. Thank you Stuart, but we couldn't do it without a small army of readers turned contributors ! I've been told Cartor for the RM Signed For, which will mean litho. What Royal Mail tell you in 'first' is what they intended: that the actual outcome may be quite different shows that they should have checked that their contractors were able to do the job before they confirmed the copy for 'first'. I checked the new definitive stock in my local office today (Tuesday) and all cylinder numbers and printing date are the same as already reported. No stock of the new Royal Mail 'Signed For' stamp was received. There were no presentation packs of the new definitives either, so the hold up with the Recorded stamps must also have caused a delay with the presentation packs. Emergency/supplementary printings due to DLR’s move to Gateshead perhaps. If so, could the 2013 definitive reprints be by Walsall or Enschede (or both) instead of De La Rue. 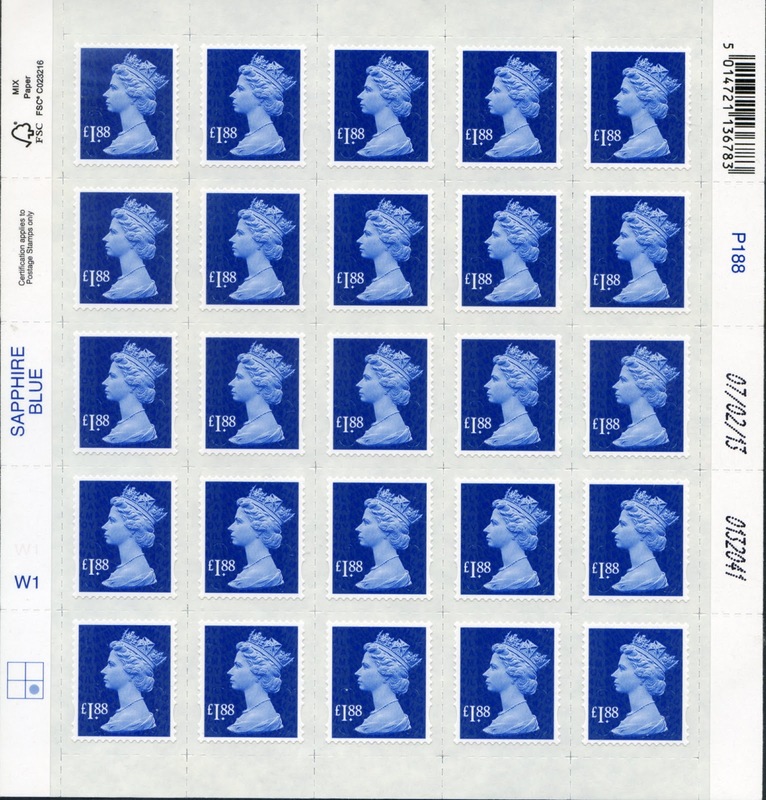 Does the four unshaded boxes in the grid mean that there was a reprint of an existing value (no Northern Ireland yet), a double printing of one of the country stamps or that each sheets will have five different positions? Having had sight of the Machin values today, not at my local office alas, they refuse to sell them until the day of the tariff increase (and have done so for the last twenty years), their appears to be a vacant position at the top left, with 78p top right, 88p bottom left & £1.88 bottom right. Will that be a Walsall reprint of an existing value or double printing of the 78p? I think you have misunderstood the purpose of the grid. 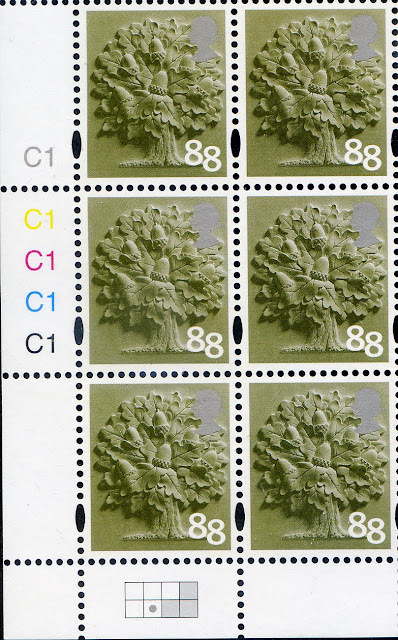 On the country stamps shown above, the grid indicates that the England stamps will be in 5 positions, as stated. The Wales, Scotland and Northern Ireland (where did you get the idea that there would not be a NI as we have already shown it) are in one each of the other three (shaded on England) positions. The grid positions on the valued stamps (£1.88 shown above) indicate that it will be printed in all 4 positions. I haven't seen the others yet but if they have no shaded boxes then they too will be printed in all four positions (which I expect to be the case as they are heavily used values). 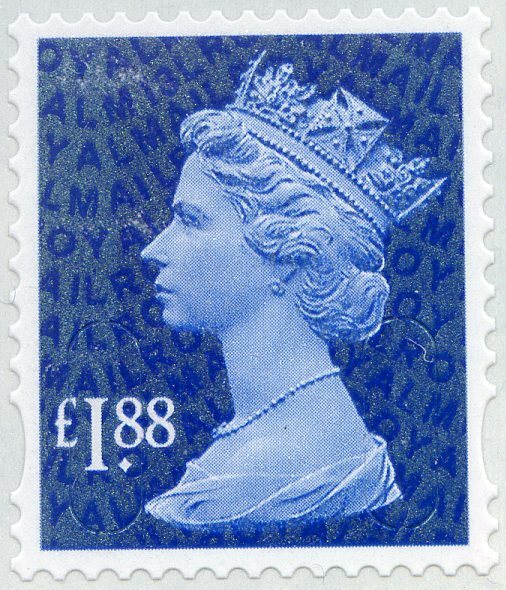 Are the Walsall-printed value stamps done by gravure? 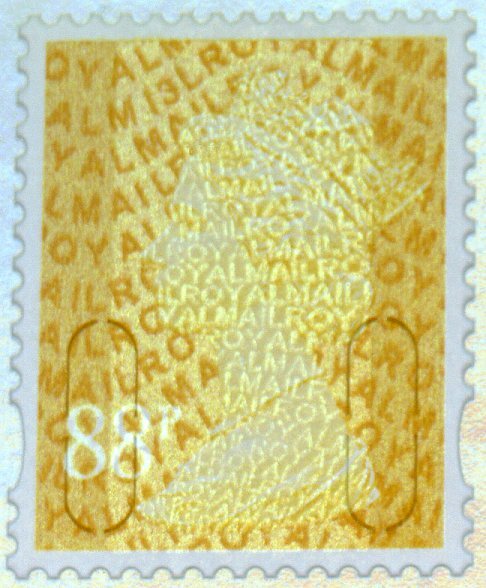 Also, from the photo above, it appears that the overprint does not cover the Queen's head on the 1.88 value, whereas it does on the other two values. Is that the case? The iridescent layer is on the Queen's head on the £1.88 - that photo was primarily to show the year coding; the absence of text on the head is simply because of the way the photo was taken. 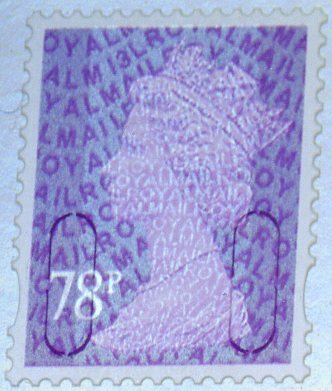 Incidentally I have been told that Royal Mail's data is technically correct, in that they contracted DLR to print the stamps. They couldn't so they sub-contracted to WSP, though as that was done in February it doesn't seem reasonable that all publicity says that they were printed by DLR! The presentation pack was not available today lunchtime at Trafalgar Square in London. I was told they hadn't had delivery as there was a problem with the printing of the RD stamps. My understanding is that Tallents House are busy dealing with Doctor Who orders and will not make up Tariff Packs for a couple of weeks. This all thoroughly disgraceful. RM know well in advance what their programme is and what needs to be provided, packed and distributed and when. To claim they are busy with Dr Who just won't do. They choose the products and dates, they need to staff up properly to supply their customers with their orders. A miserable monopoly. I'm no apologist for Royal Mail as regular readers will know, but I think this is a bit over-the-top. Tallents House could have had these stamps prepared before the Doctor Who stamps if they had been available. It is clear that De La Rue had problems with printing. That's why the valued stamps were off-loaded to Walsall. They were printed in early February. The Signed For stamps were only received in Swindon Stores for distribution to Post Office branches last week (I've had that from a Post Office HQ source), and were delivered to (only some) branches yesterday. For some reason De La Rue have not put the printing date or sheet numbers on the stamps, which is either a change in spec for Royal Mail or it may be that the ink-jet unit was not yet installed on the printer. We don't know whether these were printed in Dunstable or Gateshead: I suspect the latter as DLR's report forecast that the move would be completed by the end of the financial year. Readers should remember that the postal service and not collectors is the primary customer. Getting supplies to Edinburgh is very much secondary, and at this stage the staff there are indeed dealing with Doctor Who orders and will make up the presentation packs and send those and the stamps themselves to customers on 11 April, as indicated in first. It would be totally uneconomic to 'staff up' as you suggest, and customers were forewarned that distribution would be delayed. FDC arrangements have been extended (as also mentioned in first). Over-the-top it may be Ian, and secondary to postal services, but these are still products being offered for sale on a pre-determined date and not available as advertised. Anywhere else, this would be judged as symtomatic of an organisation in decline. It's the same with the Bulletin, now being delivered three weeks into the relevant month. As a longterm regular customer (30+ years) it all just seems to be getting worse year-on-year, and I feel very let down. Thanks for the opportunity to have this say, RM won't even acknowledge any communication, let alone acknowledge a problem! I have to say I am also thinking they are losing the plot in Edinburgh. They sent me the Dragon Generic instead of the Dr Who and I phoned them up and got a rather shirty response - I would have to wait 2-3 weeks for the replacement and they would not even admit that there had been any 'carelessness' so I said I wanted to lodge a complaint. Seems to me that since the run-up to the Olympics they are just issuing far too many products and can't manage what they are doing any more. And yes I think the collectors are important and they need to think a bit harder about us - we all use regular postal services as well but certainly provide them with a lot more revenue than they would get from us otherwise. The phone call I had today with Edinburgh almost felt like I was being told off and to 'like it or lump it'. I am a GB completist to date but just beginning to wonder if I've had enough...Not good!